Acer isn’t as well known as Apple for product design, but its new Revo One RL85 compact desktop looks dapper—and with Intel’s latest Broadwell chip it also has muscles. The multifaceted desktop can be a PC, but it also can sit in a corner and serve as a media player or be used for backup storage. The desktop is now available in the U.S., and starts at $249.99 with Intel’s entry-level Celeron processors, and at $479.99 with Intel’s Core i3 chips code-named Broadwell. With its unorthodox design, the Revo One RL85 stands out from today’s mundane beige boxes. Its sharp finish resembles a smaller version of a Kenmore bread maker, but it looks attractive nonetheless. It is just 15.5 centimeters tall. The desktop was first shown at CES and recently started shipping in Europe. At the time, Acer wasn’t clear about the specific processors the desktop would carry. 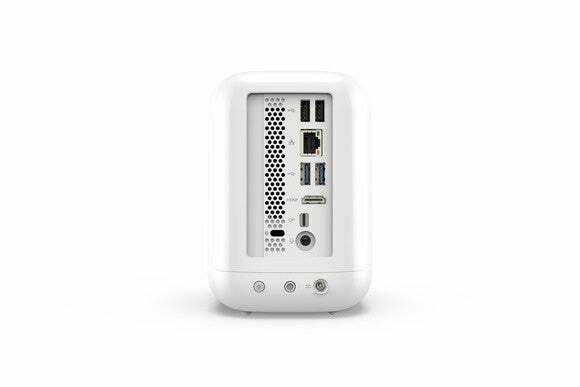 Four USB ports, Gigabit Ethernet and two display outputs are on the back of the Revo One. In all, the desktop can have storage capacity of up to 6TB in three slots, but the entry-level model comes with just a 60GB solid-state drive. There is support for multiple drives in RAID configurations, which is important when backing up and syncing data between multiple hard drives or over a network. It is also possible to control the desktop remotely through an iOS and Android app called Acer Revo Suite, which allows users to watch movies, view pictures and access other multimedia files stored in the PC. That gives it appeal as a multimedia center, especially if the desktop is connected to a TV set. The desktop also comes with a remote control, which can function as a minikeyboard and a scrolling device. 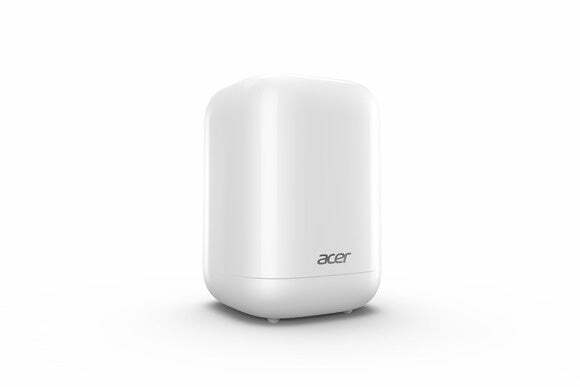 Another app, called Acer Smart Control, allows multimedia files to be streamed from mobile devices to the PC and on to a connected TV. At the back of the PC are two USB 3.0 ports, two USB 2.0 ports, an ethernet slot, and two display—HDMI and DisplayPort—ports. In all, the desktop can support up to 8GB of DDR3 DRAM. An oddly placed SD card slot sits on top of the PC. The desktop comes with the latest 802.11ac Wi-Fi.